Richard continues to watch in shock as the acid bubbles away on his armor, threatening to reach his flesh beneath it. Robo intones that the acid was shot by hydronomizers, subterranean land guardians. He says that alkali will neutralize the acid, and Richard inquires where they would find such a substance. Robo says it's found in ammonia rain, which is collected by the landscape in pools. Remembering those horrible-smelling pools they had passed by earlier, Richard leads his dissolving friend over to one of the pools nearby. They make it to the pool just in time. Richard cups his hand, dips it into the pool, and pours the liquid over his armor, stopping the acid from reaching his skin beneath. He then does the same to Robo, pouring the acid over the spots that were eating away at the robot. Richard's only damage is to his suit, but Robo apparently suffers a memory malfunction because of the acid. The robot advises that they leave the area while he figures out the extent to which he is damaged. Richard agrees and the two start to head out again. As they do, Richard notices a new binary message has appeared on the robot's panel - he translates its message as he did with the first one. The landscape soon changed yet again,this time into a dusty land of power where occasional rock spires dotted the landscape. Intrigued by one of the nearby spires, Richard attempts to approach it when a sudden burst of white light shines at his feet just in front of him. Stunned, Richard looks up and sees something amazing. 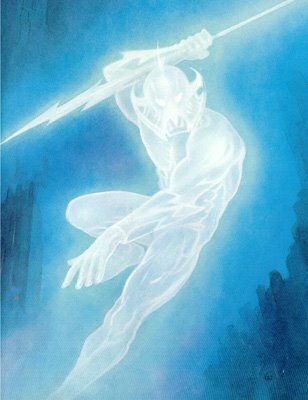 A white humanoid being was floating from behind one of the spires, in his hand a lance of pure white light. Robo quickly identifies the being as Zenon, the laser lancer, and says the creature attacks based on motion. When Richard asks if that means he has to remain still, Zenon answers that question by firing another shot at him while Richard attempted to move. Robo instructs Richard to duck behind a nearby spire while Robo distracted Zenon. When the robot catches Zenon's attention, Richard quickly ducks behind the spire while Robo dodges several laser throws. Robo quickly joins Richard behind the spire, but Zenon destroys the spire with one of his powerful blasts. Richard is forced to remain still once more, but he suddenly remembers the binary message and asks Robo if he has anyway to reflect Zenon's attacks. Robo answers in the affirmative and turns around to face Zenon. The light creature fires several deadly blasts at the robot, but instead of destroying him, they bounce harmlessly off him. Using a mirror panel, Robo reflects several of the blasts back at Zenon, striking the unsuspecting creature dead on. At first nothing happens to the creature, but then Zenon begins to change color and expand into a colorful fireball until he implodes, vanishing completely in midair. Richard compliments Robo for having the mirror, but Robo plainly suggests they keep moving. The two of them set off once again on their journey. Soon the landscape becomes similar to a giant jigsaw puzzle dried out by the sun. As the two of them walk, a loud sound is heard and Robo suddenly orders Richard to jump to his right. But his movements are too slow, and a large crack emerges beneath his feet and splits open, revealing a giant chasm. Richard tumbles into the chasm but grabs onto the edge with his hand. He cries for help as the ground shifts beneath his hand, and he could feel himself losing his grip. Just then, a metal hand grabs his arm and pulls him to safety. Richard is happy to see Robo hoisting him onto solid ground. Richard looks around, expecting a destroyed landscape from the earthquake, but sees pretty much exactly what he had seen earlier. Feeling apprehensive of being in this area, he is more cautious about stepping on the cracks in the ground as he and Robo make their way across the jigsaw landscape. Thankfully, after a while, the scenery changes from a cracked area to more featureless plains. In the distance, Richard can see an enormous ocean of a silver liquid. Eventually, the two companions arrive at a high cliff overlooking the sea below. When Richard wonders what the liquid is, Robo warns that it is mercury, which is poisonous to all life forms. Richard stares at the poisonous liquid for a good while before looking away, and it's then that he notices Robo is gone once more. He starts to panic and calls out for Robo to return. Just then, he hears a loud humming sound approaching his direction, and within a few moments a strange craft with Robo on it appears. 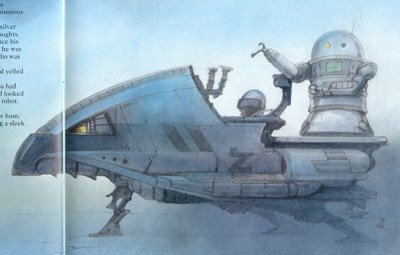 Robo identifies the craft as a cybercruiser, which had been hidden in the landscape, and states it will help them speed up their travels. Robo insists that Richard familiarize himself with the controls, which Richard does as Robo indicates what the complicated console buttons do. When Richard asks if he could take the cruiser for a test drive, Robo says yes, though says he should wear the safety visor located in the cruiser. Richard nods and gets into the seat of the cruiser, putting on the visor and adjusting his seat. Within moments, he is off the ground and flying the cruiser. He experiments with how the hovercraft can maneuver, and he is soon flying high and flying low and pushing the craft to as fast as it can go. He soon begins to enjoy himself, the first time since entering the Cyber Dimension. He grows confident enough to fly over the sea of mercury, but his overconfidence pushes him to turn too quickly, causing the craft to tilt to the side too much. He slips out of the seat and falls out of the cruiser, landing with a loud splash inside the mercury ocean. Richard feels like he is in a bucket of mud, and he suspects he will eventually sink into the dark depths of the poisonous liquid. He is thankful that his armor and visor will protect him from being poisoned, but he knew he had to get out before he was submerged. The cruiser is too far above him to reach, and Robo is still on the shore. He knew he would be in for a bit of a wait. The mercury is up to his waist by the time Robo arrives to the rescue. He arrives by flying under his own power and hovers just above Richard, extending his telescopic arm to lift Richard out of the mercury. 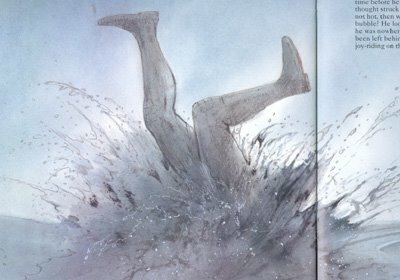 The metallic hand grabs Richard and lifts him out of the sea, and everything seems fine. 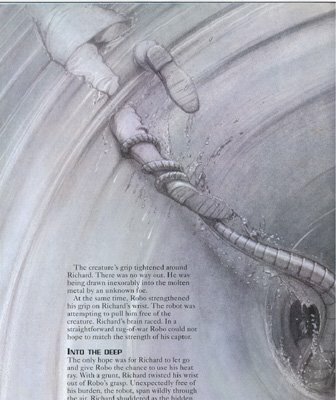 But suddenly, a whirlpool emerges just beneath Richard, and a metallic tentacle shoots out and wraps around Richard's leg. Robo tries to pull harder to release Richard, but the tentacle's owner is too strong. Realizing the only way to escape was to give Robo a chance to use his laser, Richard twists free of the robot's grip and allows the tentacle to drag him deeper into the mercury ocean. The one thing (and perhaps the only really notable thing about this issue) that struck me about the twenty-eighth issue of The Ancestral Trail was the noticeable lack of the monster. Like Tengam in the previous issue, the laser lancer Zenon was not really the focus of this issue. He was actually more of a diversion than anything, similar to the hydronomizers that threatened to melt the two companions at the beginning of the issue. Obviously, this is all the monsters can do at this point, as Richard doesn't really have a purpose at the moment other than the vague idea of finding the Evil One.